Our new years resolution for 2017 is to keep you better informed about new data and data updates, so you can get the most out of Community Insight. Community Insight now includes information on the local jobs market, allowing you to find which local areas have the highest concentrations of jobs. We have included headline measures of jobs density (jobs per working age population as well as breakdowns by industry of employment and public/private sector – with figures on full-time and part-time employment to be updated end of the month). Data is from the Business Register and Employment Survey (BRES) of approximately 80,000 businesses and weighted to represent all sectors of the UK economy. A range of life expectancy indicators have been added or updated to the system including life expectancy at birth, healthy life expectancy (the average number of years that an individual might expect to live in “good” health in their lifetime) and disability-free life expectancy (the average number of years that an individual might expect to live free from a limiting persistent illness or disability in their lifetime). Figures are published by the Office for National Statistics (ONS). 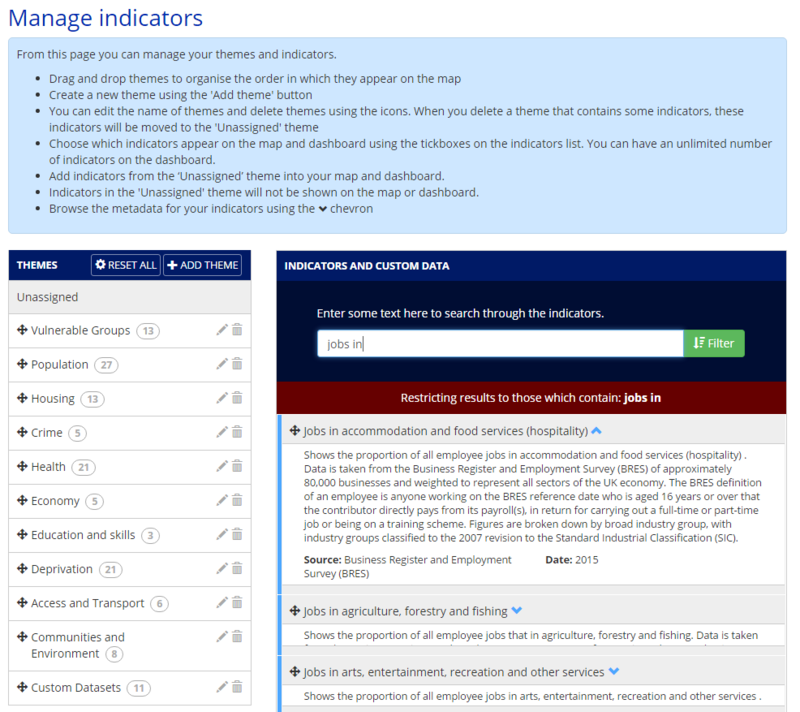 To find these new indicators go to the Unassigned theme, on the Manage Indicators page, search for the following keywords: jobs, life expectancy. If you need a reminder of how to add new indicators to your maps and dashboards, check out this article in our Knowledge Base. Do you have ideas for new indicators? New indicators like these often come directly from the feedback we get from our users. So if you have some suggestions for new indicators, then let us know on support@ocsi.co.uk. Provided that the indicator is open data and available at LSOA level then we will add it in to Community Insight. Updated population estimates: Population estimates for 2015 (ONS mid year estimates) are now available at neighbourhood level providing up to date estimates of the local population by gender and age. Note, with the updates to the Mid Year Estimates we have also made adjustments to all of the indicators on Insight which use the MYEs as a denominator – including all DWP benefit datasets, business datasets and crime datasets hence the slight delay in publication of these. How can I view all the datasets available in Community Insight and a full list of the most recent updates? To see a list of all the datasets available in Community Insight and also a full list of the new updates check out this Knowledge Base article. With all these brilliant new data updates, now would be a great time to update your reports. To update your reports, simply click Request Report on the Manage Custom areas page. For more information about the Reports in Community Insight check out the Report section in our Knowledge Base.